With its strong French heritage, striking natural scenery, beautiful architecture and forward-thinking vignerons, Franschhoek is a must-stop destination for visitors to the Cape, says Angela Lloyd. Read her Franschhoek travel guide here. Franschhoek is incredibly picturesque, the road through the valley flanked by imposing mountains that loom ever closer as one approaches the town. The Huguenots settled in the valley in the 17th century, after fleeing France and the revocation of the Edict of Nantes. Vineyards and wineries bearing the names of many of these Huguenot pioneers line either side of the road, continuing up the slopes and then over the Franschhoek Mountain Pass at the end of the valley. Pause at this turn-off to explore the graceful arched monument and museum recording the Huguenots’ past. From the mouth of the valley, lavender fields, olive groves and fruit orchards intermingle with the vines, providing an ever-changing sea of vegetation. 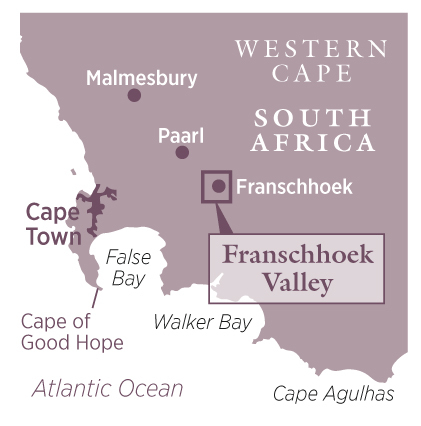 If there’s one grape associated with Franschhoek, it’s Semillon, a variety which ruled in Cape vineyards at the end of the 19th century. Old vineyards – some planted well over a century ago – produce wonderful wines, distinguished by their beeswax, lanolin and silky viscosity, all of which get even more savoury and sumptuous with age. Wine of Origin appellation. An initial tasting across many vintages to identify aromas, flavours and style resulted in amazing commonality within each. A subsequent blind tasting identified 11 wines across the three varieties as showing sufficient typicity and quality for the local judges to make them recipients of the first annual Appellation Grand Prestige awards (agpc.co.za). What resonates with this initiative is that, while it aims to recognise a sense of place, there’s no question of prescribing as to which varieties may be planted. For instance, Wynand Grobler, the young winemaker at Rickety Bridge (ricketybridgewinery.com) who has AGP winners across all three varieties, is developing vineyards on his north-facing slopes for Rhône grapes. If you’re keen to check out authentic Franschhoek flavours, Franschhoek Cellar (franschhoek-cellar.co.za) and Haut Espoir (hautespoir.com) produce other AGP Semillons, while Maison (maisonestate.co.za), Môreson (moreson.co.za) and Chamonix (chamonix.co.za) join Rickety Bridge in having the region’s most typical, quality Chardonnays (look for lime and lemon flavours). Craig McNaught’s Stonybrook Ghost Gum (stonybrook.co.za) makes the only other AGP Cabernet, with typical purity of blackcurrant and blackberry. 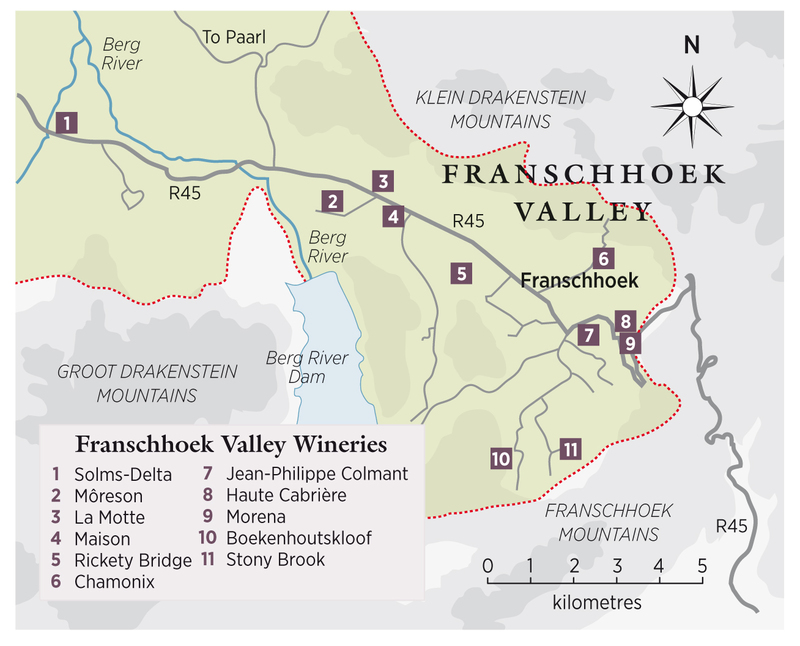 Stylistically, Franschhoek wines can be described as self-assured yet unshowy and elegant. There are plenty more quality producers to explore. At Boekenhoutskloof (boekenhoutskloof.co.za), Marc Kent produces excellent Franschhoek old-vine Semillon and Cabernet, as well as a renowned Syrah from bought-in grapes. La Motte’s (lamotte.co.za) Pierneef Shiraz-Viognier is one of the very few successful versions of these co-fermented grapes in the Cape, while Landau du Val’s Semillon, from vines planted in 1906, can also be a gem. As well as illustrious, long-lived Chardonnays, Chamonix’s varied soils, altitudes and aspects allow Gottfried Mocke to make great Pinot Noir, Cabernet Franc, Pinotage and Sauvignon Blanc, the latter blended to great effect with Semillon. (‘The vines need to be old for Semillon to make a standalone wine,’ he says.) Several Franschhoek origin wines are made in tiny quantities with annual releases being sold on allocation, although a query about an odd bottle or two to Ludwig Maske at La Cotte Inn Wine Sales might be rewarded with success. Franschhoekers will party at the drop of a hat; there’s hardly any time of year that a visit doesn’t coincide with a festival. None is more fashionable and fun than the Cap Classique and Champagne Festival, held towards the end of November or early December. Méthode Cap Classique (sparkling wine made using the bottle-fermented method) is an integral part of the valley’s wine offering; there’s even a Cap Classique route with downloadable map (http://franschhoek.org.za/vignerons-de-franschhoek/ franschhoek-cap-classique-route/). While many wineries include an MCC using traditional varieties as part of their range (La Motte and Stonybrook are particularly good), Jean-Philippe Colmant (colmant.co.za) of his excellent eponymous winery, Nick Davies of Morena (morena-mcc.com) and the von Arnim family of Haute Cabrière (cabriere.co.za) take their passion a step further, specialising in the style. The Franschhoek Uncorked festival heralds spring in September, when wineries open their doors to showcase the release of new vintages but the major festival is the mid-July Bastille Weekend, when the whole town is en fête. But for a true Cape experience, try for a ticket to the Oesfees (harvest festival) at Solms-Delta (solms-delta.co.za), a day-long feast of local cuisine and toe-tapping music, played by amateur and professional bands. Franschhoek might well have recently attracted investment from Virgin’s Sir Richard Branson – he has bought a wine farm in the valley – and well-known Indian businessman Analjit Singh, but the ambience will remain one associated with small, privately owned wineries. Thanks to a plethora of excellent restaurants and other activities such as walking and hiking trails, and the chance for a spot of trout fishing on some farms, there’s a lot more to do besides enjoying Franschhoek wines.